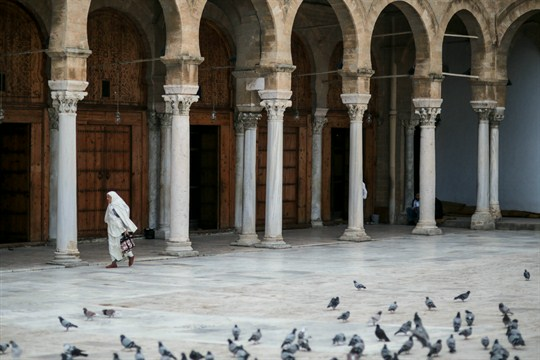 A woman prepares to perform Friday prayers in the courtyard of Zitouna Mosque, the oldest mosque in Tunisia, Tunis, Oct. 23, 2015 (AP photo by Mosa'ab Elshamy). In this week’s Trend Lines podcast, WPR’s editor-in-chief, Judah Grunstein, and associate editor, Elliot Waldman, discuss British Prime Minister Theresa May’s week of humiliations on the shambolic road to Brexit. For the Report, Frederic Wehrey talks with WPR’s senior editor, Robbie Corey-Boulet, about the growing power and influence of the “quietist” current of Salafism in the Maghreb and what that means for the region.